Mike, if I missed the answer to the following question somewhere in your numerous blogs this week, I apologize. Did go back just now and check a couple of your 'earthquake' blog posts, and didn't see the answer. In all your years of meteorology, have you previously encountered such a "triple point" in one week, of (1) population density, (2) a scary - if now weakening - hurricane, and (3) a relatively strong earthquake (one strong enough to damage a signature national monument and a famous cathedral) all together? No, I am not saying the quake and 'cane are related, just, wow! 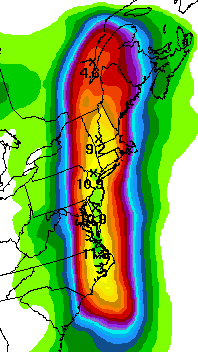 We are updating population estimates for #Irene exposure at http://bit.ly/qzpyhU. 59M total US within 100 miles of likely track. Let me add one other item: The stage collapse in Indy. Never did I think I would be in the music section of "Rolling Stone"! For me, it has been dawn to 11pm day after day, night after night. I'm really beat. People want to know about these things and I want to help people understand the science behind them so they can help make better decisions. 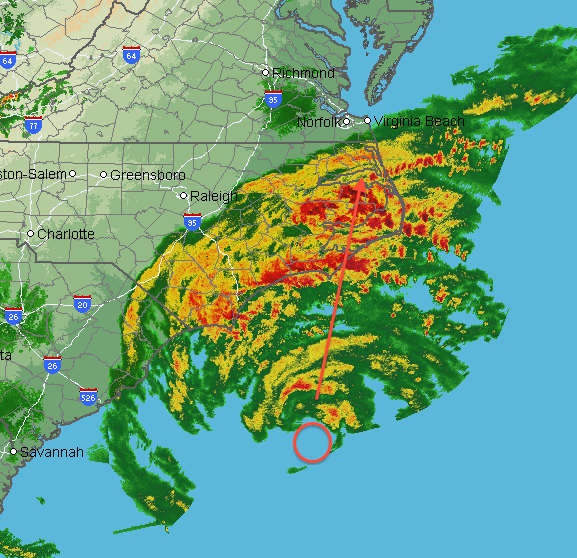 This is my passion and I am happy to do it, but I'll be glad when Irene dissipates over the North Atlantic.